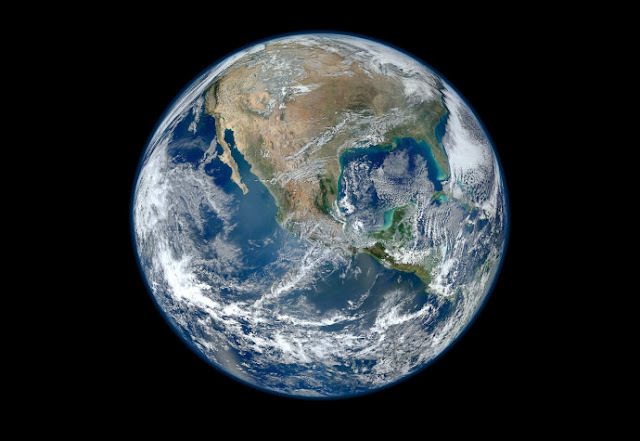 … Creating a zoom-in, zoom-out effect when looked at in sequence (from the world’s north pole to its south pole). 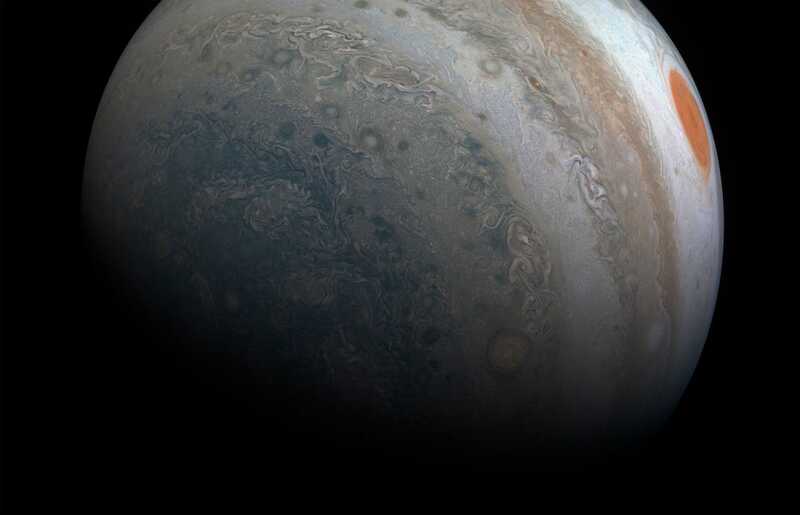 Juno beams the raw data to Earth as hazy black-and-white layers that represent red, blue, and green. 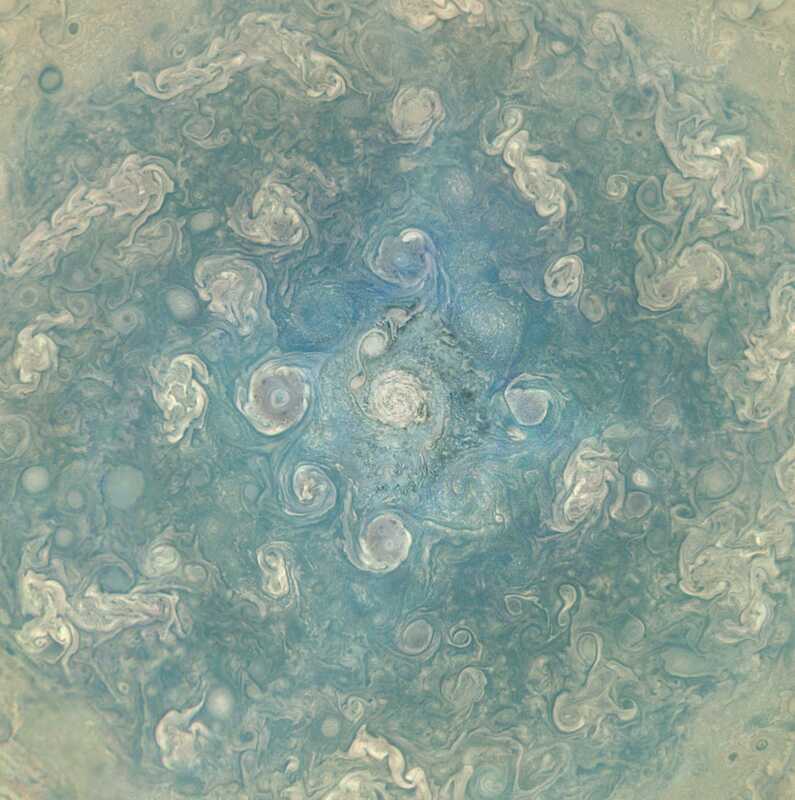 The layers can then be merged and processed into stunning planetary portraits, like this shot of Jupiter’s north pole. 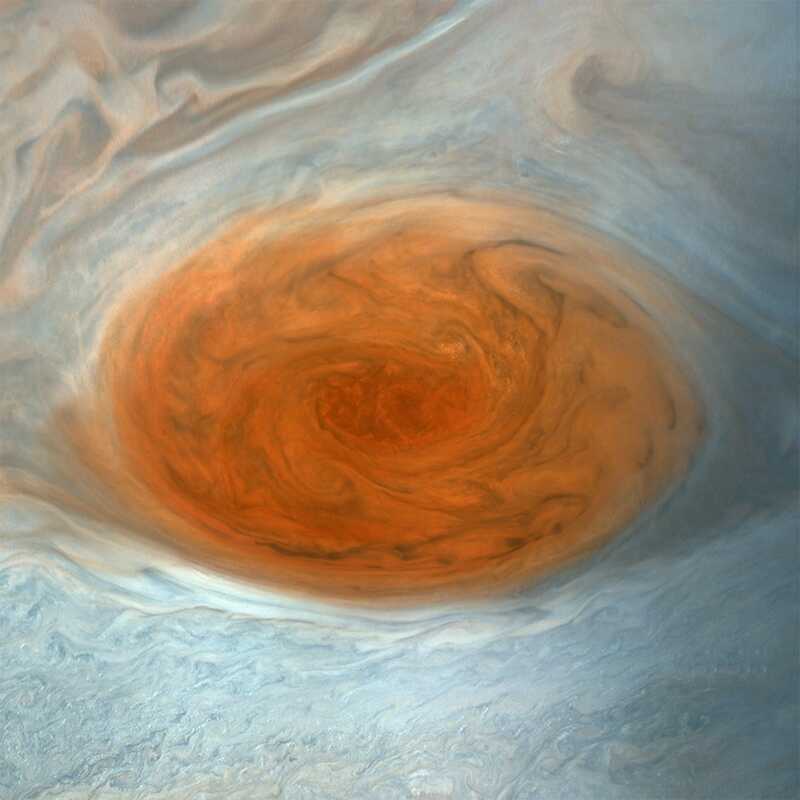 Juno last saw the Great Red Spot, which could easily contain planet Earth, in July 2017, during its seventh perijove. 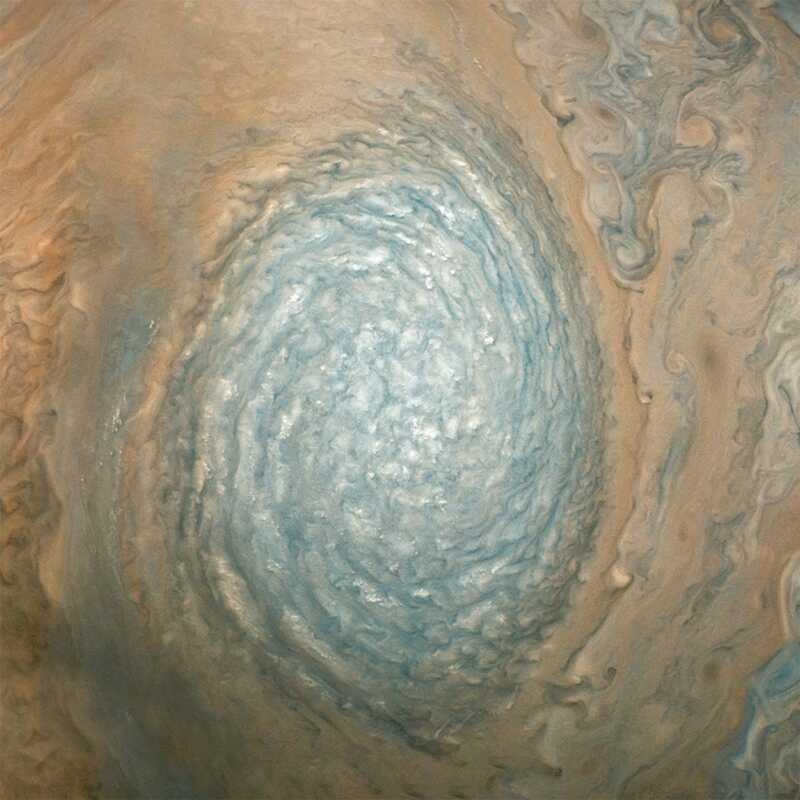 While the probe didn’t fly directly overhead this time, as it did last year, the latest images are nonetheless breathtaking. 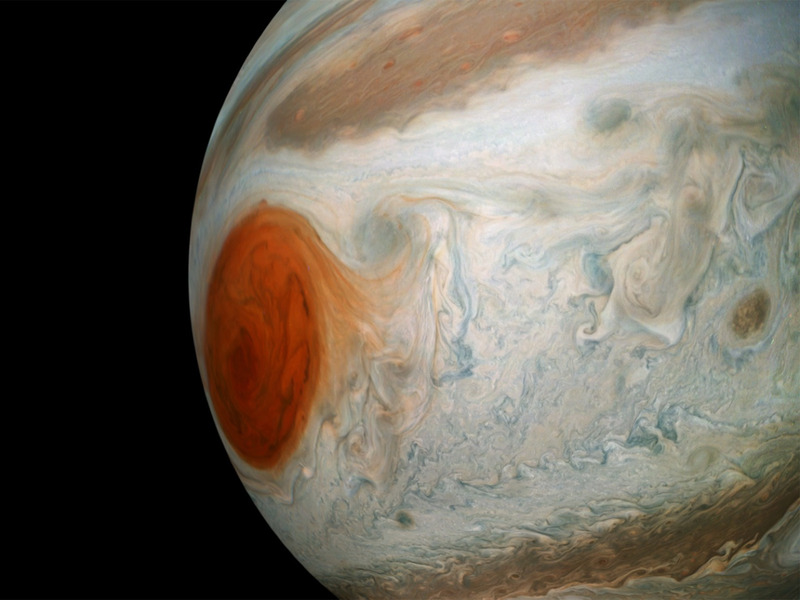 This one, processed by Doran, makes it look like Jupiter has an leering ruddy-red eye. 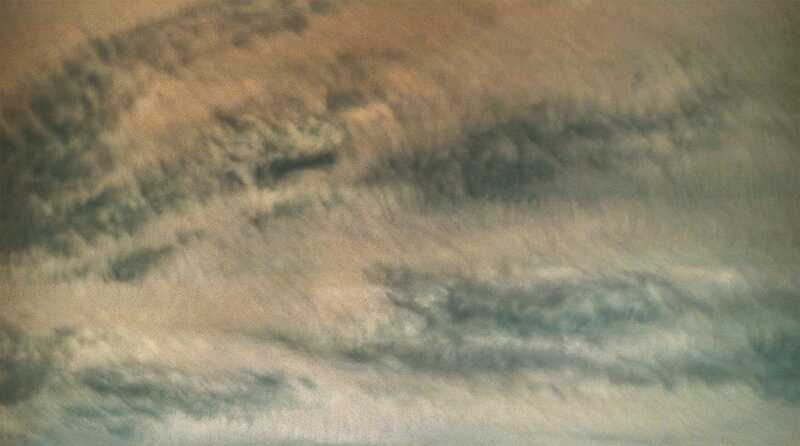 This wider-angle image, processed by NASA software engineer Kevin M. Gill, shows the small storms in more detail. 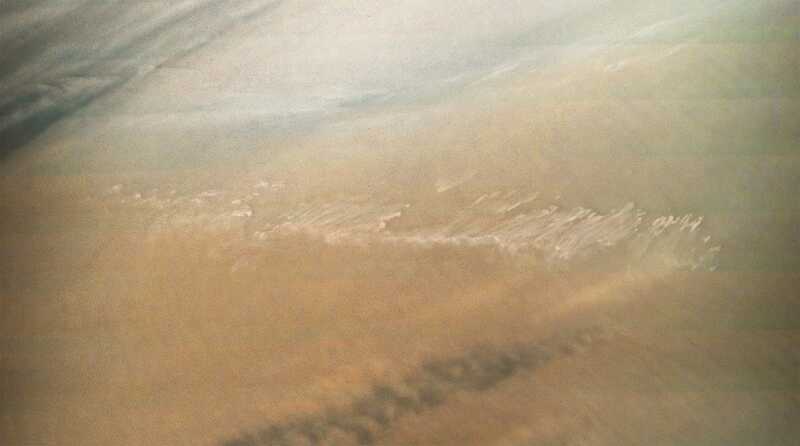 Here’s the strange feature in more detail. 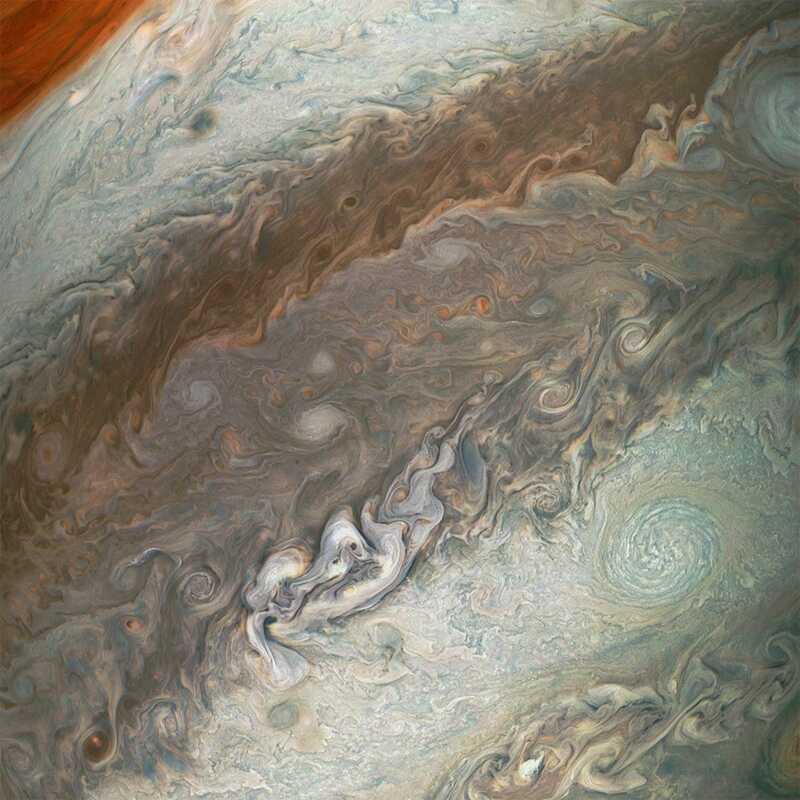 Near Jupiter’s poles, the patterns of storms are especially wild. 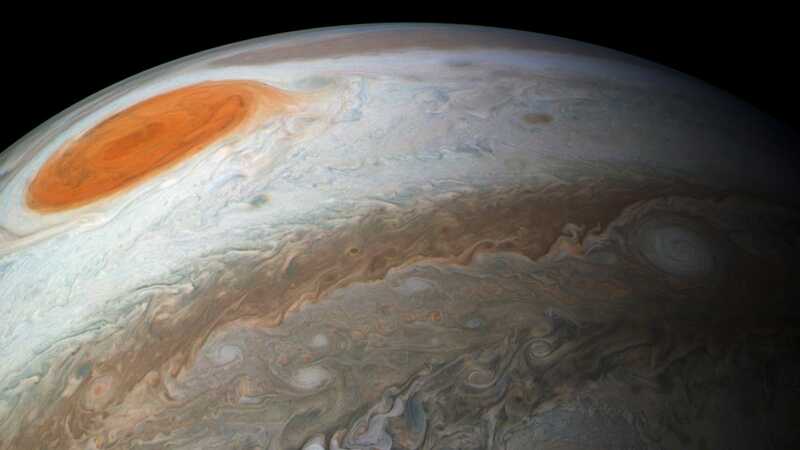 Chemicals like ammonia, which float high into Jupiter’s cloud tops, help give many polar storms on the planet a blue-green hue. 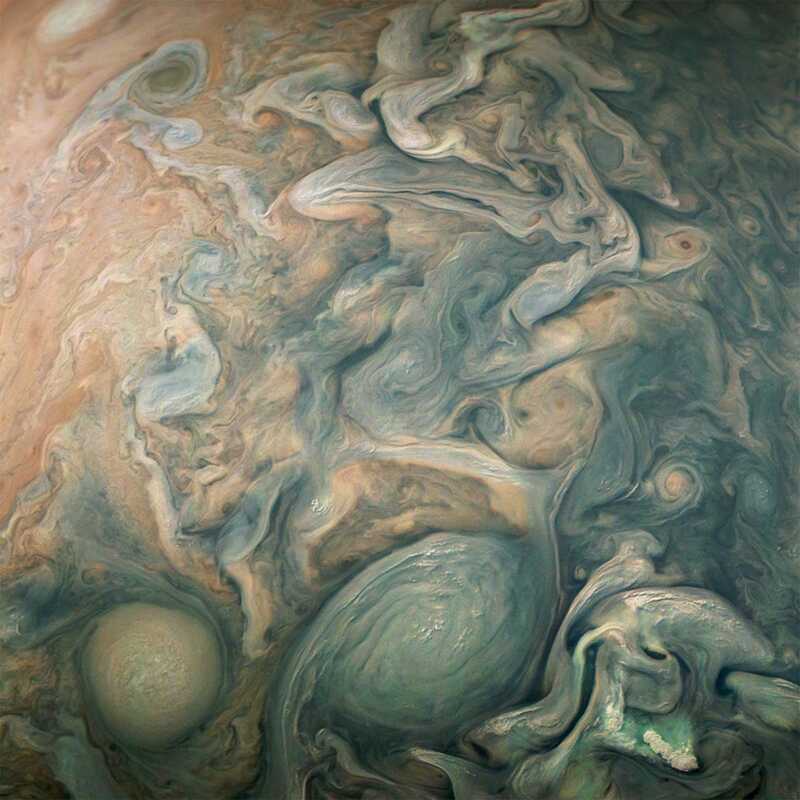 The details of clouds captured by JunoCam during its closest approaches are equally mesmerising. 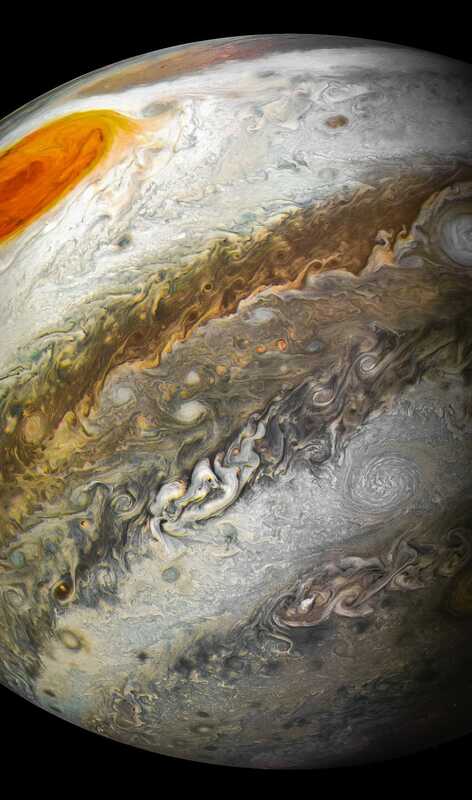 Juno passes within a few thousand miles of Jupiter’s cloud tops during the closest approach of each perijove. 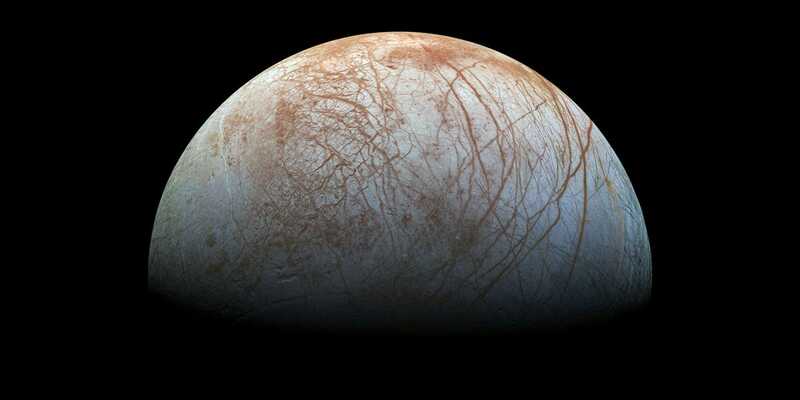 During this manoeuvre, the probe reaches a speed of about 130,000 mph. 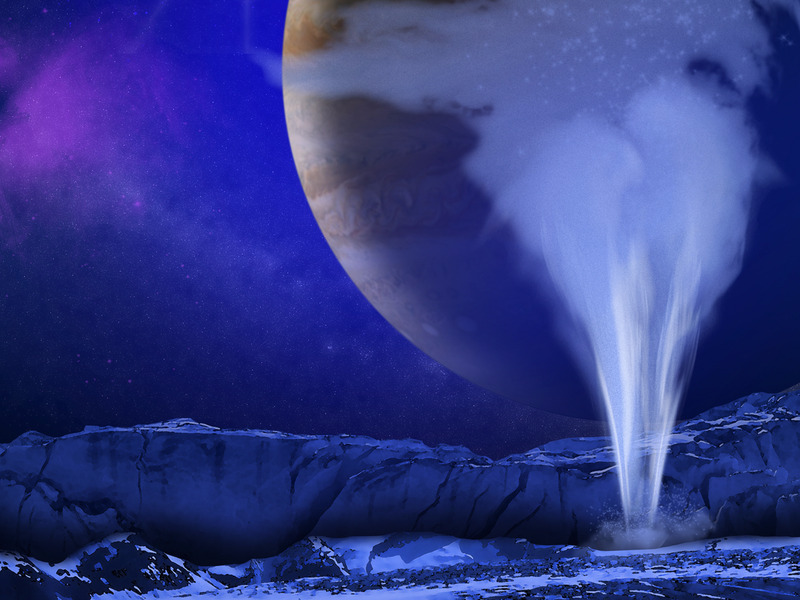 They’re learning other new tricks, too, and using them on older JunoCam data. 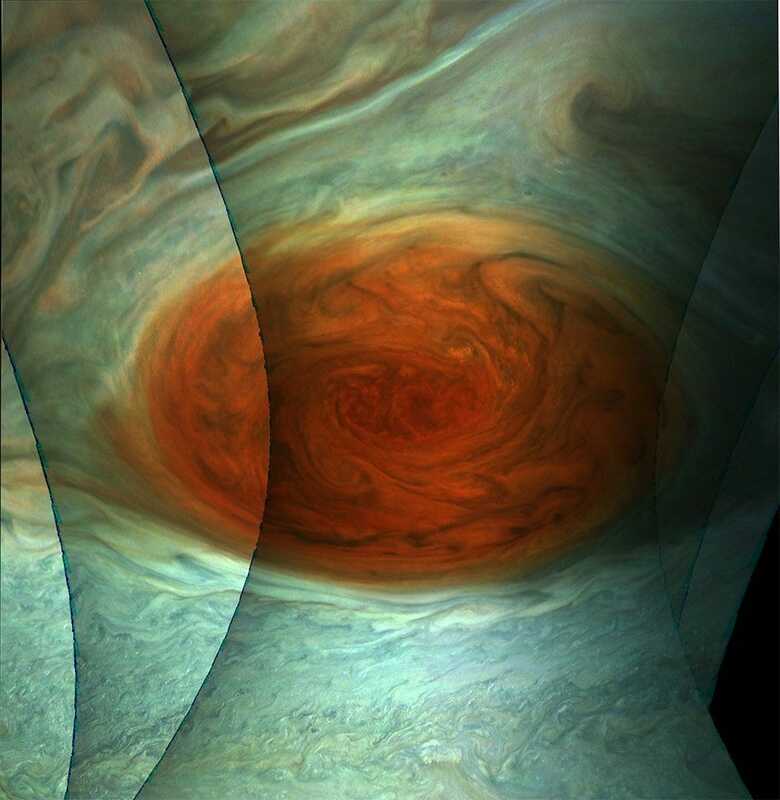 This image shows how three separate photos of the Great Red Spot in July 2017 were stitched together. 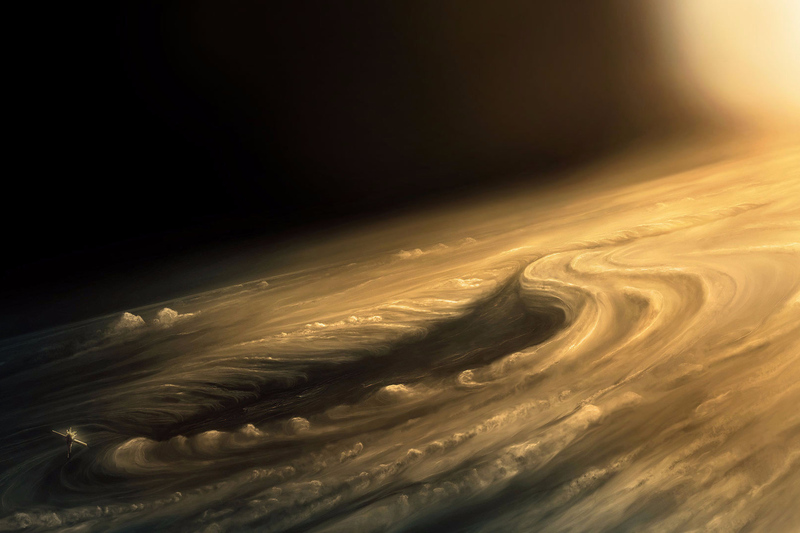 Here’s the finished, fully processed version of that image. 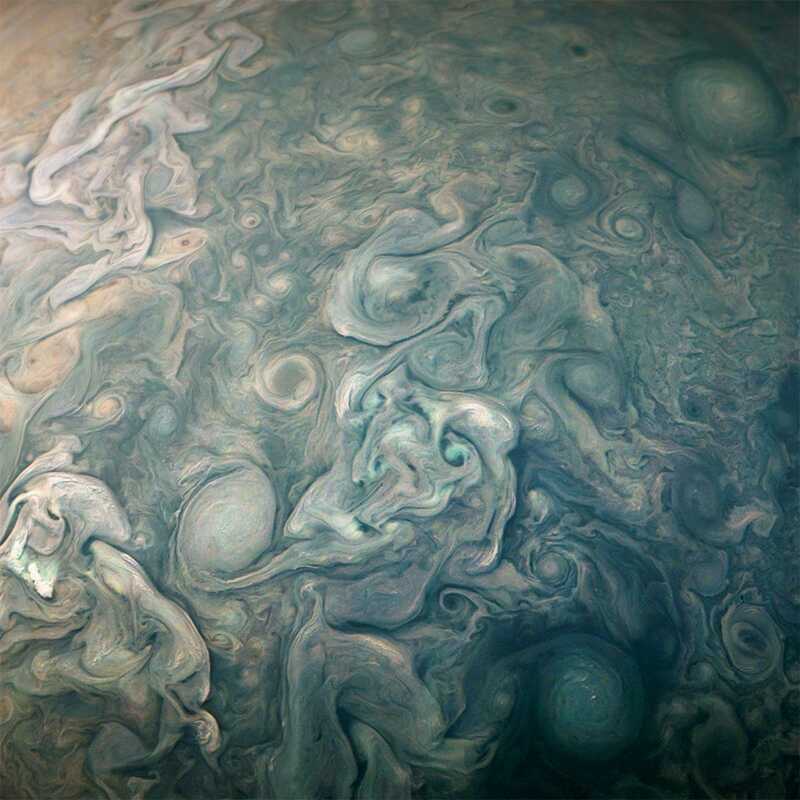 Björn Jónsson created this image of Jupiter’s bizarre north pole using a combination of photos from Juno’s first, third, fourth, and fifth perijoves. 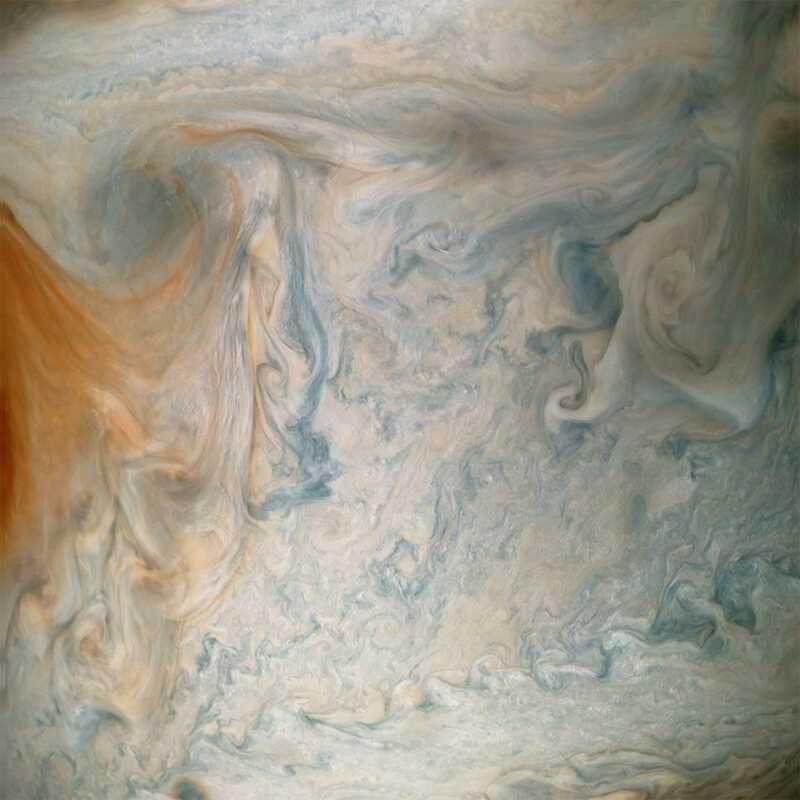 In addition to JunoCam data, he incorporated images from the probe’s aurora-mapping instrument, called JIRAM. 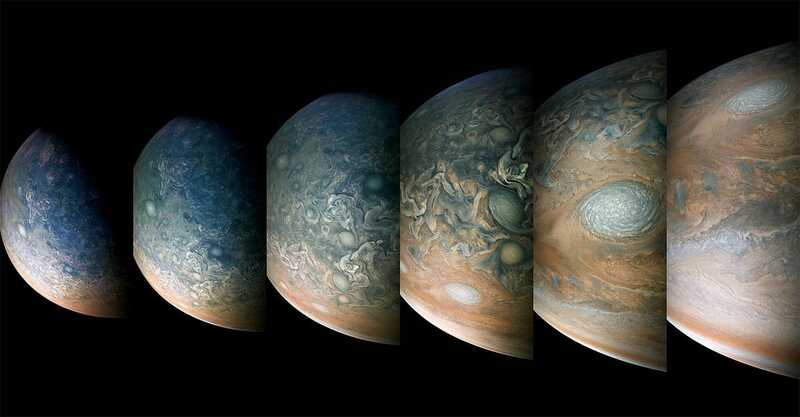 Juno’s primary mission is slated to end after its 14th perijove, on July 16, 2018. 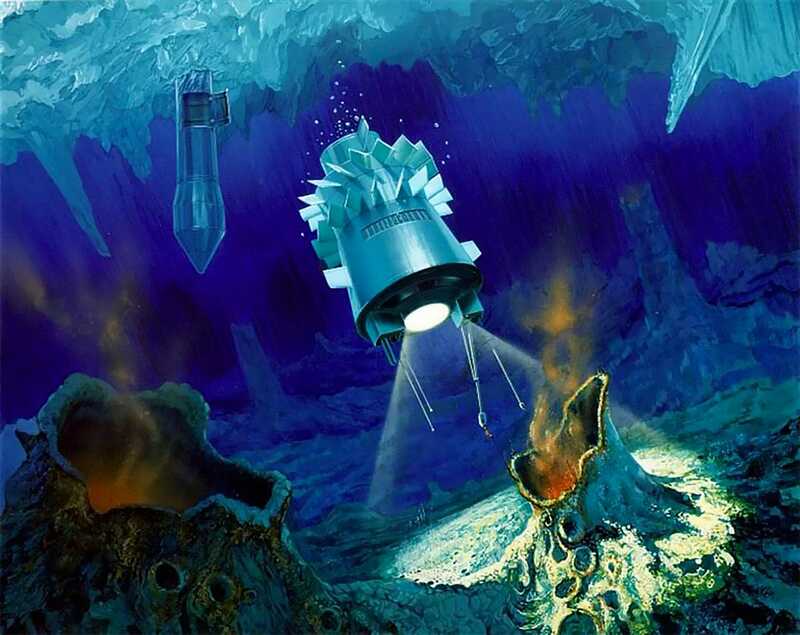 However, NASA may extend the mission by two or three years, pending a review. 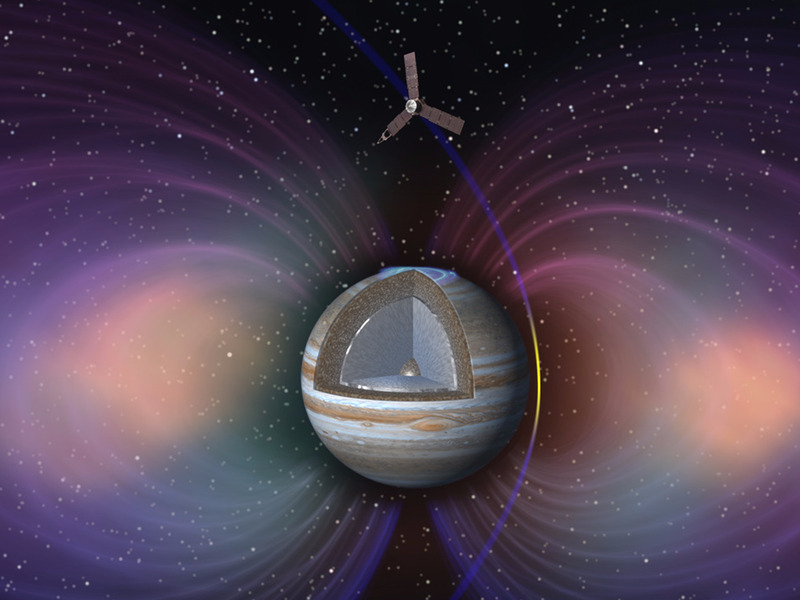 An illustration of NASA’s Juno spacecraft flying through the radiation belts of Jupiter.